Ergonomic Scrubber For Natural Exfoliation and Cleaning. Clean any hard to reach area with this powerful brush. A long, ergonomic handle has a slight bend in it to provide the perfect angle, and a large, natural loofah sponge delivers the cleaning power necessary. It's ideal for washing that part of your back that nobody can reach, but it's also nice for any other area that gives you trouble. Scrub your feet without bending over, cleanse shoulders and ankles without strain, or exfoliate all over quickly and easily. The natural fibers will deep clean your skin without being abrasive, and as you use it, dead skin cells will be removed, your pores will open up to release toxins. The end result is cleaner, more healthy looking skin, with less bending, stretching, and straining to get it that way. You'll spend less time trying to get clean, and more time admiring your fresh and youthful looking skin. A wide handle makes it comfortable to use while bathing, and the integrated hanging rope makes it easy to dry and store when you're finished. Much more powerful than a regular sponge, loofah are nothing more than dried out fruit. This fibrous member of the cucumber family is quite edible when harvested young, but becomes a dense mass of fibers as it is allowed to mature. Upon picking the fruit for use as a scrubbing tool, it is fully processed to remove everything but this interweaving network of natural fibers, and then dried out to create the hard sponge with a slightly rough surface that is familiar to everyone. The resulting surface is quite durable and long lasting, and it will provide an effective scrubbing surface that is safe for all skin types. It softens when damp, so as you use it, the sponge will conform to your body while remaining gently abrasive to do it's job. As you slide it across your skin with the long reach handle, it will easily remove stubborn dirt as it rejuvenates your skin. The natural material will actually hold more soap than regular cloths and scrubbers, but then rinse out more thoroughly when you're finish with it. When hung up after washing, it will dry quickly to remain an effective and sanitary way to clean your body. Beyond the naturally powerful scrubbing sponge at the end of this brush, there are many other characteristics that also set it above similar alternatives. The dark, natural wood handle is longer than most, and also features a slight bend toward the top. This curving of the handle makes any body part easier to reach, and will ensure that more sponge is touching the area you are trying to wash due to the improved angle. For this reason, anyone should be able to clean any part of their back with this long, ergonomic brush. To improve comfort, a rubberized hand grip has been added to the lower portion of the handle as well. Most other versions available are nothing more than a straight stick, but this one is contoured and padded for comfort. Not only is this grip squishy to make it feel nice, it is also ridged to improve control. The added texture will keep the tool securely in your hand no matter how much slippery soap you add. The large sponge on the end is high quality and durable, and it is secured better so that it stays in place for the lifetime of the brush. When finished washing, you are able to choose two different methods of storage and drying. Use the integrated rope loop to hang on any existing hook, or use the powerful suction cup to stick and hang from tile fiberglass and other smooth surfaces. Stop struggling and stretching in vain. Get all of your hard to reach spots cleaner than ever with this powerful, and easy to use brush. It will go beyond just washing to open pores, release toxins and rejuvenate your skin's appearance as it eliminates dead skin. No type of dirt stands a chance against this powerful scrub brush, but it is gentle enough for use with any skin type. 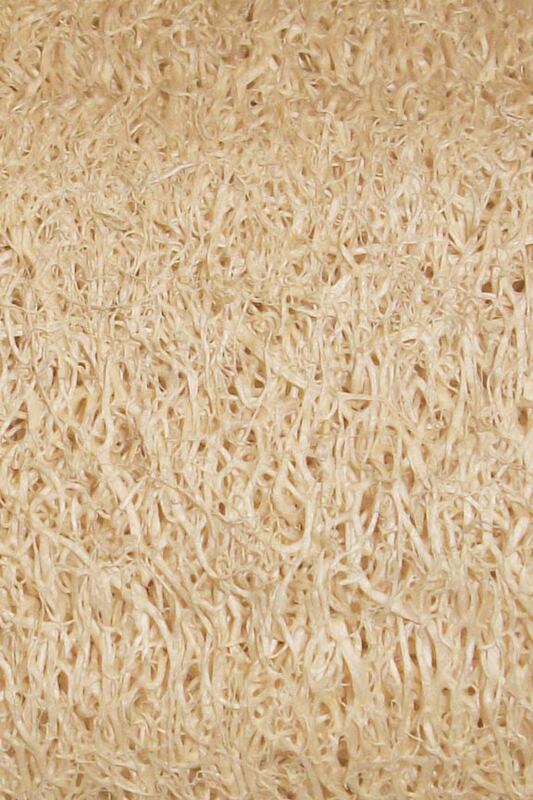 The natural fiber is more effective than synthetic alternatives, and the deluxe design makes operation a breeze. Reduce frustration caused by trying to reach areas that are impossible, or save time by replacing regular brushes with this improved alternative. Order Yours Today! Overall Dimensions 14.5" x 3" x 2.75"
Loofah Dimensions 4" x 2.75" x 2.75"
Uses Cleaning, exfoliating and invigorating. Remove stubborn dirt, rejuvenate skin, and stimulate blood flow. Easily reach any part of your body and apply necessary pressure. Perfect for back scrubbing, but useful for any other part that is difficult to reach as well. Ergonomic Handle Yes - A gentle bend makes it easier to scrub. Integrated Hanger Yes - Rope loop for use on existing hooks. Non-Abrasive Yes - Gently scrubs without harming your skin. Skin Type Safe for all skin types. Compatibility Use with any of your favorite soaps, or use alone when dampened with water. Scrub without stretching or straining, and gain the benefits of natural loofa scrubbers. Remove dead skin as you clean your hard to reach parts. Increased blood flow with rejuvenated skin, and opened pores will release dangerous toxins. Order Yours Today! I really enjoy the loofah. I got it to stimulate my skin while I lose weight and that is supposed to help tighten the skin while you lose weight. I am crossing my fingers. While the unit is sturdy, I didn't expect the brush itself to be so hard. Even when wet, it feels more like a rock than a sponge. The suction cup holds nicely on the shower wall however. I like it. Some people had complained it was to rough, I find it is just right, it gives my back a good scrubbing. I like this product, except for the fact that the loofah part won't stay attached to the handle. The first time I used it, the loofah slipped off while scrubbing my back. I put it back on as tight as I could and finished my shower without any problem. But when it was hanging up to dry, the loofah just slipped out on its own and fell into the tub. Now when I try to slide the pieces back together, they are completely loose. The only way I can use it now will be to nail or screw the loofah onto the stick. Bad design! The brush was too stiff to use comfortably. These back scrubbing loofahs on a stick (actually, wooden handles!) are great. The loofahs are great qualityquite large and do a great cleaning jod. Makes hard to reach places sooo easy. The product is well made, and attractive. The price was fabulous. I just recently purchased this item and was VERY disappointed. Ive tried for a week soaking the sponge to get it soft and pliable to work for me. after all this, it is still so rough it will tear the skin right off my back. My skin is not overly sensitive but I couldn't use it "as is". I ended up cutting off the Loofah, buying a rectangular sponge of the right size and density and Gorilla glued it to the handle. Since the handle also had a tendency to slip out of the part which holds the sponge, I glued that in too. I'm happy now, and the handle is long enough to reach everything I need it to, plus the rubber grip on the handle lets you keep a good grip and it won't slip out of your hand. I'm giving it 2 stars for the length of the handle. I'm giving myself 5 stars for making it usable without having to throw it away. Sorry, I can not recommend it in its "natural" state. simplygoodstuff response: This brush is not meant to be soft. Loofah is a natural scrubber and exfoliator, and not like softer, more absorbent sea sponges. We are glad to hear you were able to adapt the high quality handle to suit your tastes. 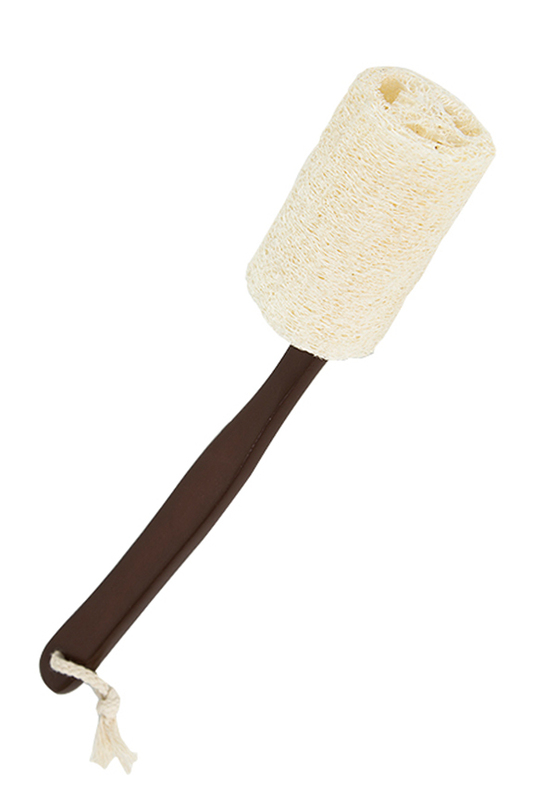 The loofah part of the brush became unattached from the handle. The brush part slips into the handle; it also "slips" out of the handle when you use it. I've had to add a screw to keep it in place! simplygoodstuff response: The two parts are meant to detach. That way you can use it off the handle. When new, it will be really tight, but it is wood, so heat and moisture from your shower can cause it to loosen. In this case, you simply re-set it to keep them together. Once slid into place tightly again, the loofah should stay on securely. Great item. Long enough to reach the hard to reach spots, tough enough to care for the itchy spots. Great sturdy item. If you have the same problem, just let us know. We would consider it a defect, and it should not be expected. We do not have any additional photos to show how it is attached, but it will be secure unless you are unlucky enough to duplicate this rare situation. What is normal life span of this product and is the loofah sponge replaceable, if so how much $ and where to purchase replacement? Exact lifespan is going to vary from person to person, but it should last quite a while for anyone. There is no replacement for the sponge available at this time. Clean Your Bathtub or Shower Without Scrubbing! Cleans Dirt & Grime that Traditional Wash Cloths Leave Behind. A Fast & Easy Way to Wash Your Feet. Prevent Clogged Drains In Your Bathtub Or Shower.